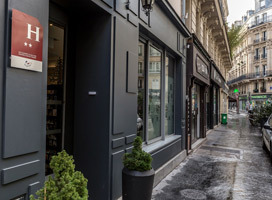 The 2* deluxe District Republique Hotel lies within easy distance of one of Paris`s main railway stations, Gare du Nord This means that guests travelling in by train or Eurostar are only 10 minutes away by Metro, or 15 minutes on foot for those who travel light. Alternatively Gare de Lyon can be reached in around 25 minutes via Metro. Famous sites such as The Louvre and Notre Dame Cathedral can be enjoyed with a 20 minute trip on the Metro, or a leisurely 30 minute stroll through the Parisian streets. The shopping opportunities of the Champs-Elysees are around 25 minutes away by public transport and the iconic Eiffel Tower can be reached in 35 minutes, from here unrivalled views over the city can be found. More Info. Family rooms: No Family rooms.